GANGNEUNG (South Korea): Short-track speed skater Lim Hyo-jun claimed a first gold medal for South Korea on Saturday as the hosts made a triumphant start to the Pyeongchang Winter Olympics. 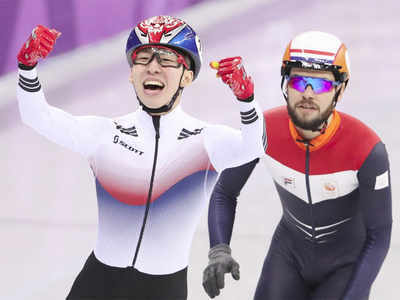 Lim got Korea off the mark on the first full day of action in the men’s 1500m in front of an ecstatic, near-capacity 12,000 crowd at the Gangneung Ice Arena. With South Korea’s President Moon Jae-in watching, together with American Vice-President Mike Pence, Lim delivered the goods to further embellish Korea’s dazzling record in the sport with their 22nd short track title. Korea had two shots at the target but Hwang Dae-heon crashed out of the final, causing a collective groan from the home supporters. Canada’s Sochi 2014 champion Charles Hamelin scraped into the nine-skater climax in a four-way photo-finish in his semi-final, but there was to be no repeat for the bearded 33-year-old as he picked up a penalty.